Following the keynote address delivered by Ambassador Olaph TERRIBILE, Permanent Representative of Malta to the UN in Geneva, on «Freedom of Religion or Belief: Toward an Agenda for Implementation» - under the auspices of Malta's 2017 Presidency of the Council of the European Union – (January to the end of June), the Secretary General of the AIDLR, Dr. Liviu Olteanu, talked with His Excellency on the prospect of a collaboration between Malta and the AIDLR regarding the defense of human rights and religious liberty in Europe and at international events. Photo: H.E. 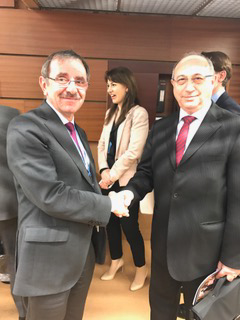 Ambassador Olaph TERRIBILE, Permanent Representative of Malta to the UN in Geneva, and Secretary General of the AIDLR, Dr. Liviu Oltanu, Representative of the AIDLR at the United Nations in Geneva.